The Malto are one of the tribal groups of India, and a lesser number of them live in Bangladesh. In Bangladesh, their primary language spoken is Mal Paharia, but in India their primary language is Santhali. In total, they speak three languages in Bangladesh and 31 languages in India. 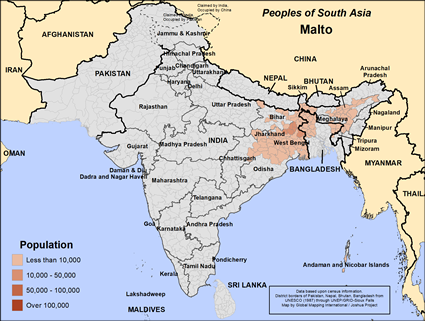 The Malto tribe lives mainly in the Indian states of Bihar, Jharkhand, West Bengal, Assam, and Meghalaya. Malto individuals can be farmers, teachers or politicians. They educate their boys but not their girls. They are not vegetarians and eat wheat and rice as their staple foods. Hinduism is their religion. Hindus can worship no gods or many gods. Some become “devotees” of a particular one. They do not have a caring or committed relationship with these gods. They believe that at death the soul continues in another life (reincarnation), so eternal salvation is not what they seek. Most Hindus seek to be reincarnated as a member of a higher caste in the next life. It is sometimes challenging to be a Hindu in a Muslim land like Bangladesh. 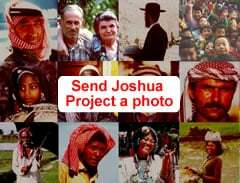 * Pray for the Holy Spirit to give the Malto people teachable and understanding hearts. * Pray for a strong movement of the Holy Spirit that will bring entire Malto families into a rich experience of God’s blessing. * Pray for Malto families to be drawn by the Holy Spirit to seek forgiveness, and to understand the adequacy of Christ’s work on the cross. * Pray for teams of believers to do sustained, focused prayer for the Lord to open the hearts of Malto family leaders to experience God’s blessing through a movement of family-based discovery Bible studies. https://en.wikipedia.org/wiki/Malto_peopleView Malto in all countries.